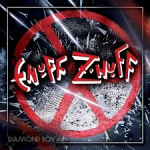 Share the post "Album review: ENUFF Z’NUFF – Diamond Boy"
Enuff Z’Nuff returned to action with 2016′s ‘Clown’s Lounge’, although that was older songs recorded back in the band’s early days with some updating . ‘Diamond Boy’ marks the first album without any input from former singer Donnie Vie. Bassist Chip Z’Nuff now handles lead vocals and the band consists of guitarists Tony Fennell (ex-Ultravox) and Tory Stoffregen with Dan Hill on drums. Stoffregen and Hill have joined the band since ‘Clown’s Lounge’ was released as Enuff Z’Nuff have had a fluid line-up in the past few years. The short, harmony vocal filled ‘Transcendence’ opens the album before the title track kick starts the album. A trademark Enuff Z’Nuff song that has a Cheap Trick vibe and like the next song, ‘Where Did You Go’, shows its Beatles influence loud and proud. ‘Dopesick’ goes for the full on Beatles 60′s psychedelic trip and sounds glorious it has to be said. The outro vocal harmonies are simply divine – this is the band back firing on all six. If anything the album goes for a more psychedelic pop rock sound than on their last couple of albums, full of sweet melodies and only ’Faith, Hope, Luv’ and ‘Metalheart’ are below par. This entry was posted in ALBUM REVIEWS, ALBUM REVIEWS (Mobile), All Posts and tagged album, Beatles, Chip Z'nuff, Diamond Boy, Donnie Vie, Enuff Z'Nuff, melodic, pop rock, psychadelic, review, rock. Bookmark the permalink.